This is one of those "I just had to share" moments! I snapped a few photos of my husband and Rowynn over the weekend. 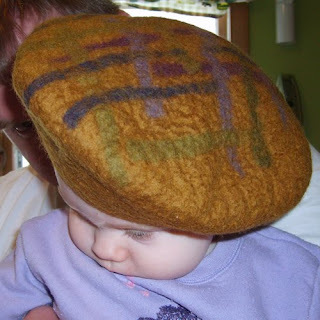 She is wearing a hand felted wool beret that I made quite a long time ago. It was originally meant to be for an adult, but it ended up being one of my many felting experiments gone astray when it shrank a bit too much. It fits Rowynn perfectly though so I guess that I have a good pattern for baby beret's now and that hat making experiment long ago wasn't a complete loss. 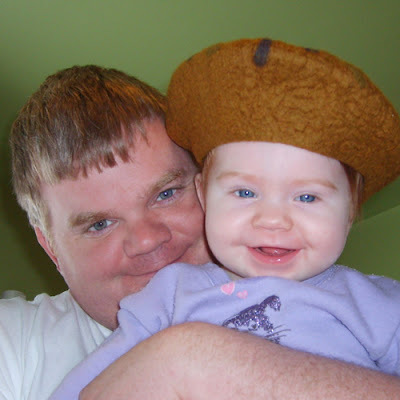 More importantly, it makes for a darn cute photo with daddy. These will be so much fun to scrapbook! What a sweet family you have!! I adore the beret!! What a providential mistake!! Love the beret and what a cutie. Will have to file her name for a cool fantasy character or a doll. Fits her perfectly! She could sell anything. Nice to have Daddy included...what could have fit him turned out to still be a winner on Rowynn!